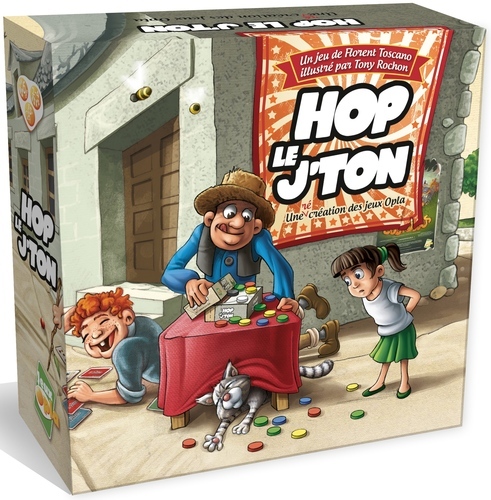 Hop le J’ton is the third game in the series of games which recreate street games (Hop la puce and Hop la bille). In this game, players try to place their chips in a way to push the scoring chips off the board. Each player has a set of chips in their color. One of each color scoring chip is placed in the center of the playing area – White (1pt), Gray (2pt), Black (3pt). The playing area is printed on the bottom of the box. There is a white semi-circle where the scoring chips are started. Beneath this is a brown rectangle where players will place their own colored chips. The top of the box is then propped up on the bottom to act as a pusher. On a turn, the active player resets the box and then places 1 to 3 of his own colored chips in the brown area. The box lid is then pushed forward to the edge of the brown rectangle, thus pushing the chips into play. If any of the scoring chips are pushed off of the box, they are collected by the active player. A chip of the same color is then placed in the playing area so that it straddles two other chips – it may turn out that this is placed on top of other chips! If any of the player chips are knocked off, they are returned to their owner. The next player in order then takes their turn. If a player happens to be out of his color chips, he must simply pass on his turn and wait until some of his colored chips are moved off the playing surface. The game ends when someone has collected 7 or more points – that player wins immediately! This is a super simple game which reminds me very much of the Treasure Chest games where you drop coins into the machine hoping that they then push valuable tokens off the board – (If you’re ever been to a casino or Dave and Busters, you’ll know what I mean). Though there is really only one thing to do in the game – place chips and push the box – it’s still a lot of fun. The unpredictable nature of how the discs will move when pushed always generates groans/laughter from the players. Though this is the third game in the series of street games, it is the first one I have played – and I’m having a lot of fun with this one. I’ll look to maybe pick up the rest of the series at next year’s Essen. 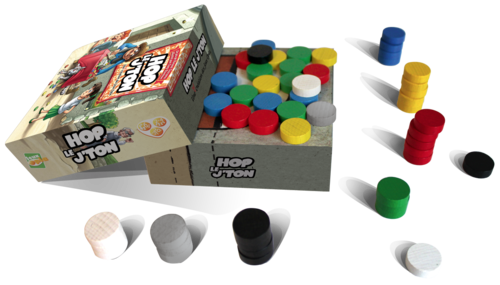 Hop le J’ton plays quick and is a nice dexterity game that we have enjoyed thus far.